Richard Gerrard won the 2014 End to End walk in hot conditions on Sunday to add the title to his Parish Walk crown from June. 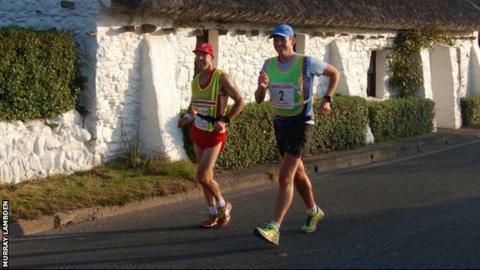 Gerrard finished the 39.2-mile race from the Point of Ayre to the Sound in six hours, 29 minutes and 23 seconds. David Mapp finished seven minutes and 12 seconds down on Gerrard, with David Walker a further 19 minutes down on Mapp in third. Michelle Turner set a new ladies record to finish fourth overall. Turner's time of seven hours, six minutes and 32 seconds was less than one minute outside the top three and 13 seconds inside Janice Quirk's 2009 record. Karen Chiarello and Karen Lawrie completed the top three women. More than 120 people completed the full distance.